It's quite a story, crossing two continents, nine decades, a couple of dozen corporate names, two different air services and not a few ships. Let me tell you about it. The Sopwith Pup was a very successful mid-World-War-I fighter aircraft. 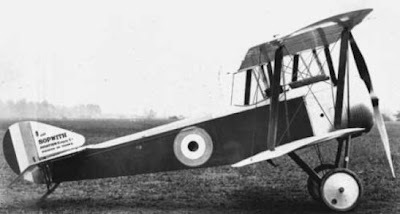 The design was originally known as the Sopwith Admiralty Type 9901, and after successful trials was officially named the Sopwith Scout. However, its crews referred to it affectionately as the 'Pup'. A disgruntled senior officer issued an order to stop calling it by that name. This had the inevitable result - the nickname became the recognized name of the aircraft and the official moniker is long forgotten! The Pup first flew in February 1916. It was powered by an 80hp Le Rhone rotary engine and carried an armament of a single 0.303" Vickers machine-gun firing synchronized through the propeller. Almost eighteen hundred were built and it served with the Royal Naval Air Service, the Royal Flying Corps (later to become the Royal Air Force) and other air arms. The picture above is of the prototype as it first flew in 1916. There are many excellent photographs of Pups at Airliners.net, and the Shuttleworth Collection in England has a flying Sopwith Pup in its fleet, video of which is shown below. Another Pup can be seen in the Shuttleworth Collection's museum, equipped with eight wing-mounted rockets intended as anti-Zeppelin weapons. Given that the aircraft was covered with 'doped' fabric which was highly flammable, I can only imagine the risks involved in firing them! It must have been a nail-biting experience. Anyway, on with our story. The Pup was the first warplane (as opposed to unarmed trainers) to be used in wartime trials for the development of aircraft carriers. It must have been a 'sporty' experience - the aircraft were slowed down upon landing by members of the deck crew grabbing leather straps dangling from the wings! You can see this in the picture below - the man at the left wing is grabbing for the straps, while the short straps on the right wing are clearly visible just outboard of the vertical struts. Cross-wires were later installed on the decks, the first appearance of what have become known as 'arrester wires' on modern aircraft-carriers. In 1916 Pups flew off 200-foot wooden decks installed on converted merchant ships, and on August 2, 1917, Squadron Commander Edwin Dunning landed one on HMS Furious while the ship was under way. Tragically he was killed a few days later when a tire burst during another landing and his aircraft crashed over the side into the sea. By now some of you are doubtless muttering, "Yes, yes, that's all very interesting, but how do you get from a World War I fighter to an ultra-modern stealthy strike aircraft?" Patience, friends - we're getting there. The Sopwith Aviation Company produced many successful aircraft during the First World War. Apart from the Pup there was the 1½-Strutter, the famous Triplane (so successful that Anthony Fokker copied the concept to produce his Fokker Dr.1, which was flown by the 'Red Baron', Manfred von Richthofen, and in which he was killed), the even more famous Camel, its successor the Snipe (which continued in service as the Royal Air Force's front-line fighter until the mid-1920's), the Dolphin, the Cuckoo and the Salamander. After World War I the Sopwith Aviation Company was forced into bankruptcy under the threat of punitive taxation of war profits by the British Government. Thomas Sopwith, his chief test pilot Harry Hawker and two others proceeded to form H. G. Hawker Engineering, taking over the buildings, equipment and assets of the now-defunct Sopwith company. In 1933 it was renamed Hawker Aircraft Limited, and in 1935 following several mergers and take-overs it became Hawker Siddeley Aircraft. During World War II it produced some of the finest combat aircraft in the Royal Air Force, including the Hurricane, Typhoon and Tempest. In the jet age Hawker Siddeley continued its tradition of innovation. Its Hunter fighter-bomber was very successful, almost two thousand being manufactured and seeing combat service up until 1980 (with the Rhodesian Air Force). The company's last design before it was nationalized was the P.1127, a vertical/short take-off and landing (V/STOL) conceptual prototype. Astonishingly, these jet fighters were produced in the very same factory buildings that the Sopwith Aviation Company had used to build its Pups in World War I! The P.1127 flew in 1960, making its first vertical lift-off in November of that year. Six prototypes were built and the design was developed into the Kestrel FGA.1, nine of which were built as evaluation aircraft and eight of which came to the USA for testing. A supersonic version was proposed, the P.1154, but was cancelled in 1965 by the government of the day. Following this cancellation the Kestrel was developed into the Harrier, the first V/STOL aircraft (apart from helicopters, of course) to enter front-line military service anywhere in the world. It entered service with the Royal Air Force in 1969 and the US Marine Corps a few years later. The Sea Harrier also served aboard Royal Navy aircraft-carriers and together with land-based variants played a vital role in the Falklands War of 1982. The Harrier was very successful, but also very difficult to fly. Its accident rate was catastrophically high. The US Marines fell in love with the aircraft and bought over a hundred, but wanted to improve it. By this time Hawker Siddeley Aviation had been nationalized and absorbed into British Aerospace (BAe), which was initially reluctant to fund the improvements required: so the Marines contracted with McDonnell Douglas in the USA to produce an updated design. BAe came on board later to produce the upgraded versions for the RAF. The result was the AV-8B Harrier II in US Marine Service and the Harrier II GR5/7/9 family in the RAF. The Harrier has achieved combat success in the Falklands, both Gulf Wars and other theaters of operation, but it's a very complex and difficult aircraft to fly. Its loss rate has typically been far higher than more conventional types of aircraft and it demands more from its pilots. Nevertheless, the advantages offered by V/STOL have kept it in service. The US Marines fly it as an attack aircraft from the US Navy's amphibious assault ships. 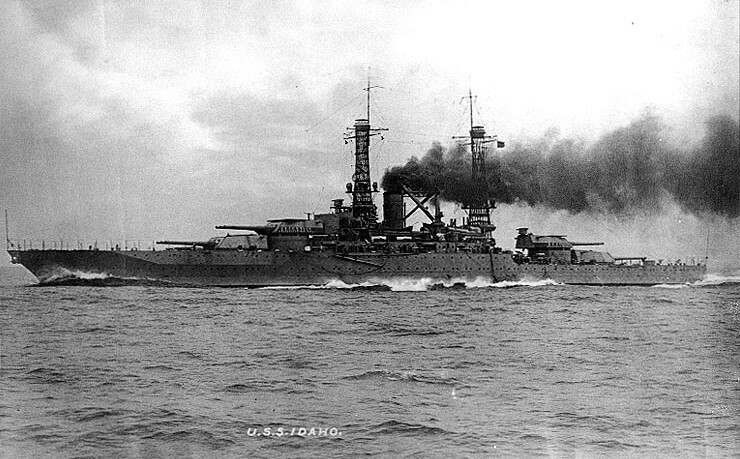 The photograph below shows one aboard the USS Nassau, illustrated next. When the US armed forces decided to develop a Joint Strike Fighter for use by the Air Force, Navy and Marines, the latter insisted that they wanted Harrier-like performance in their future aircraft. After a great deal of discussion, it was decided that one of the models of the JSF would incorporate short take-off and vertical landing (STOVL) capability, and manufacturers competing for the contract were required to produce one prototype demonstrating this ability. As the world knows, Lockheed won the JSF competition with its X-35, one prototype of which did indeed demonstrate STOVL performance. The production version of this variant, the F-35B Lightning II, is now in prototype form and about to make its first flight. However, memories of the very difficult handling of the Harrier have ensured that a huge effort has been made to make the F-35B much, much easier to handle in V/STOL maneuvers. To accomplish this, even before the F-35B has flown, years of effort have been put into testing a new flight control system on an early-model Harrier using what is known as 'vectored-thrust aircraft advanced flight control' or VAAC. This technology, developed by QinetiQ, automates most aspects of flight and has already led to the first fully-automatic vertical landing of an aircraft on a warship, without pilot intervention. An independent reviewer has said that "this technology is going to make it so spectacularly easy for a pilot to fly the STOVL variant JSF". So, the lineage between the Pup and the Lightning is now clear. The Sopwith Aviation Company produced the Pup, the first fighter aircraft to operate from aircraft-carriers; the Lockheed F-35 Lightning II will be the latest. The successor to the Sopwith Aviation Company produced the first V/STOL fighter aircraft, the Harrier, in the same factory buildings that had been used to manufacture the Pup decades earlier. The Harrier has in its turn both inspired the STOVL version of the F-35 and played a crucial role in its development by serving as a testbed for the VAAC technology that will be used in the latter aircraft. Interesting how these things work out, isn't it? 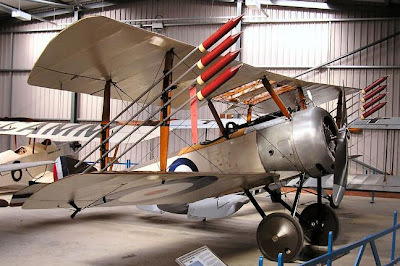 I'd been generally aware of the lineage, Sopwith --> Hawker -->l First operationally successful VSTOL combat aircraft. I did NOT know that the Harrier was built over the same oil stains left by Pups and Camels, Hurricanes and Tempests. Very interesting, HMS Furious landing!, my grandfather is in the picture 4th from the left, went onto joint the RAF 01/04/1918 having served on MHS Argus.